Bears are attracted to human-created food sources, so steps must be taken to reduce problems between bears and people. Bears are already thinking about winter and are currently in search of easy calories to fatten up. 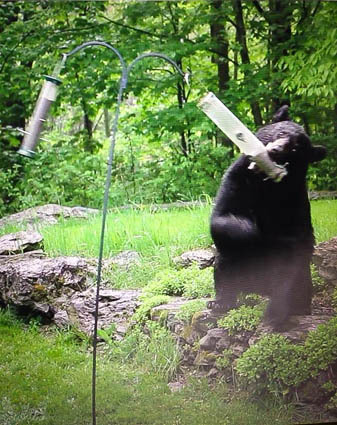 Because bears make a habit of feeding on human food sources once they find them, Forrest Hammond, bear project leader with Vermont Fish & Wildlife, says that residents should carefully manage and secure all trash, bird feeders, pet foods, and compost. Many Vermonters are wondering how to compost without enticing marauding bears. There are a few measures that can be taken to minimize conflicts, according to Hammond. Residents who compost food scraps at home should know that until full implementation in 2020,Vermont’s universal recycling law does not require residents to divert food scraps, including meat and meat-related scraps, from their garbage, when composting at home. Hammond recommends that people maintain a compost bin that is as scent-free as possible, which will help avoid attracting bears with their powerful sense of smell. This can be done with regular maintenance of the pile by adding three parts carbon-rich “brown” materials like dry leaves, straw, or ripped up paper for every one part food scraps or “green” materials. Additionally, turning the pile every couple of weeks and burying fresh food scraps down in the pile helps reduce their attractiveness. Other methods could include burying food scraps deeply in your garden, known as trench composting, or using a home solar digester. Compost is not the only food source that may interest bears. “If you live where bears are common, your trash and pet food bins must be properly secured, using a bear-proof container if necessary,” said Hammond. The Vermont Fish & Wildlife Department also recommends that bird feeders be removed between April 1 and Nov. 30, and that beehives and chicken coops should be secured with electric fencing in bear country. Residents are now required by law to remove bear attractants and are prohibited from killing problem bears without first taking extensive non-lethal measures. For more information on living with black bears, visit the “Living with Wildlife” page at vtfishandwildlife.com. For more information on Vermont’s new universal recycling law, including the “Materials Management” map of local composting facilities, go to recycle.vermont.gov.